Dr. Jamie Speirs is the first author of the paper. A two page summary of the full report is available to download. The presentation slides can be found on Slideshare. First author, Dr. Jamie Speirs describes the findings from the report in this video (2 minutes 41 seconds). 13/09/17 – Attended The UK Committee on Climate Change (the CCC) roundtable workshop to help shape their call for a future gas research call. 02/11/17 – Invited to participate in AScEnD workshop in Edinburgh. 06/17 – Attended telecon with Malcom Graham (Parliamentary Office of Science and Technology (POST)) to help inform POST Note on gas network decarbonisation. 07/17 – Institute of Gas Engineers and Managers (IGEM) conference, July 2017. 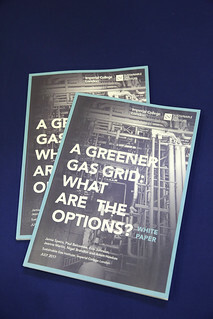 12/17 – Attended Carbon Connect round table steering group for the second paper in their Future of Gas series, attended by Alan Whitehead MP, James Heappey MP and Alistair Carmichael MP.